A soup similar to this was posted by a bunch of people on Pinterest recently, which I made and liked a lot. Then Aunt Suzy emailed me this recipe, which was very similar but looked better. Instead of using cream to make it a creamy soup, you puree some of the potatoes, which I like better. 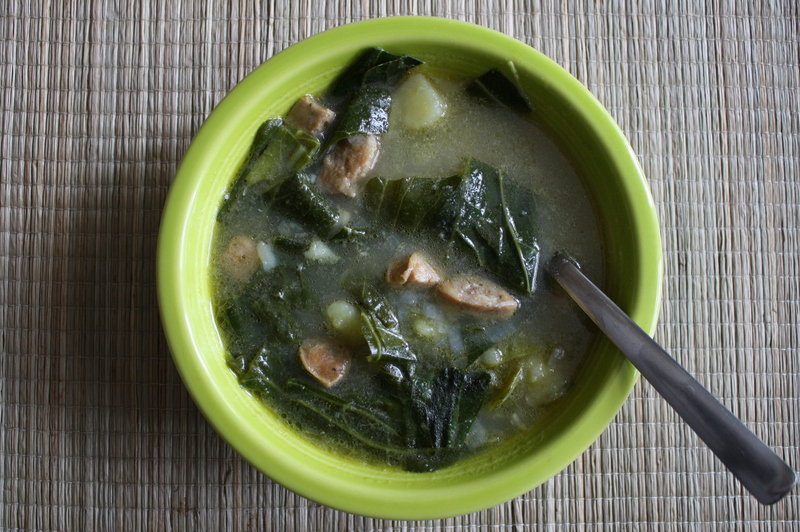 I waited a few weeks to try this one out so that we didn’t over do the potato-greens-sausage soup around here, and I’m so glad I got around to making this! It is fantastic…blows the other soup out of the soup pot. Ha! And my husband, Jason, raved about it as well, claiming it to have the “best broth ever.” He’s really good about complimenting my cooking, but this was more emotion than he usually shows about food. So I put this one in the “win” column and will be definitely making it again! I think that you can switch out different kinds of greens/sausage/potatoes to suit your likes. I made it with spicy Italian sausage because that’s what I had on hand, instead of the chorizo. Next time I’ll make it with the chorizo probably, but the spicy Italian was still good. I prefer Yukon gold potatoes, but russet would be fine, too. And as for the greens, I would stick with tougher, bitter greens like collard, or any type of kale. I don’t think spinach or chard would hold up as well. The main thing that made this soup stand out to me was the process of taking out part of the potatoes and pureeing them to make the broth thick and creamy. As Margaux mentioned, our initial foray into the greens/potato/sausage soup arena was a recipe we saw on Pinterest that we both made exactly according to the recipe, me with chicken and Margaux with pork sausage. Then my guy Randy shared this recipe with us from Cook’s Illustrated, which we tried shortly thereafter. I’ve made the Pinterest one with regular kale and unpeeled russets and another time with Lacinato kale, unpeeled Yukon Golds and fully cooked Italian sausage from Trader Joe’s. And then I’ve made this recipe exactly as specified. All are really good, but I think this one is the winner. Pureeing some of the potatoes with olive oil creates an emulsion that makes for a very silky texture without dairy. Today, I’ve made one of our favorite stews, and Randy asked me if it included sausage – hehe, guess we’ve had enough sausage around here for a while. Heat 1 tablespoon oil in Dutch oven over medium-high heat until shimmering. Add chorizo and cook, stirring occasionally, until lightly browned, 4 to 5 minutes. Transfer chorizo to bowl and set aside. Reduce heat to medium and add onion. Cook for a few minutes till translucent. Add the garlic, 1 1/4 teaspoons salt, pepper flakes and black pepper to taste. Cook, stirring frequently, another 3 minutes. Add potatoes, broth, and water; increase heat to high and bring to boil. Reduce heat to medium and simmer, uncovered, until potatoes are just tender, 8 to 10 minutes. Remove 3/4 cup solids and 3/4 cup broth to a bowl or measuring cup. Set aside. Add collard greens to pot and simmer for 10 minutes. Stir in chorizo and continue to simmer until greens are tender, 8 to 10 minutes longer. Cook’s Notes: If you live near a Whole Foods, Amylu Chicken Chorizo in a 9-ounce package works really well with this and the 9-ounces seemed like enough. You can try with or without the vinegar. AS didn’t use it and Margaux did. We have been BUSY around here. With Desi starting school and Stella being at that age where she doesn’t sleep all the time anymore and is into EVERYTHING, I haven’t had time to do much of anything other than cook dinner and do dishes. The rest of the (extremely dirty) house and my side projects have definitely suffered. But fall is here, and I’m cooking new and fun things again, so I’m doing my best to make time to post about them. 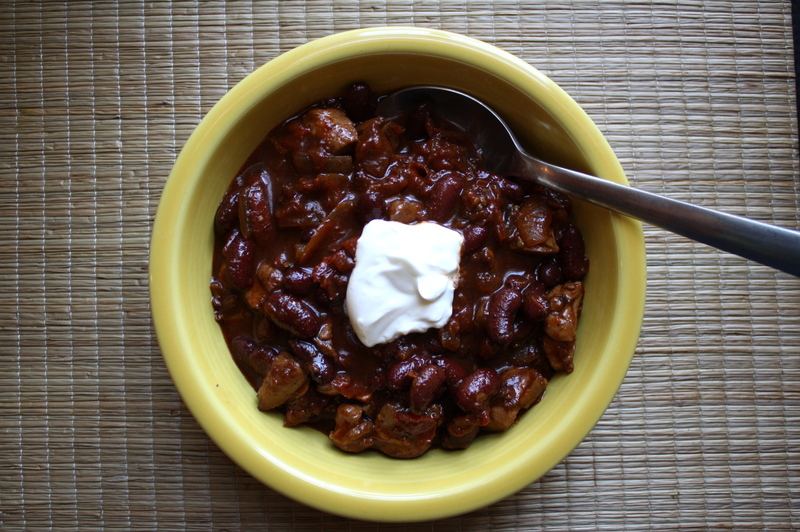 My husband raved about this chili, and actually got really protective over the leftovers. I knew this meant that he really REALLY liked it, because usually I’m the only one in this house that eats any leftovers. The charred veggies gives the chili a little bit of a smoky flavor…it’s very different than any chili I’ve ever made. So I’m definitely making it again, even though that means I’ll have to make Desi his own little pot of chili because this one has meat in it AND is pretty spicy. But that’s ok…more leftovers for us. Preheat broiler, with rack 3 inches from heat source. Arrange tomatoes, jalapeno and onion, cut side down, on a rimmed baking sheet. 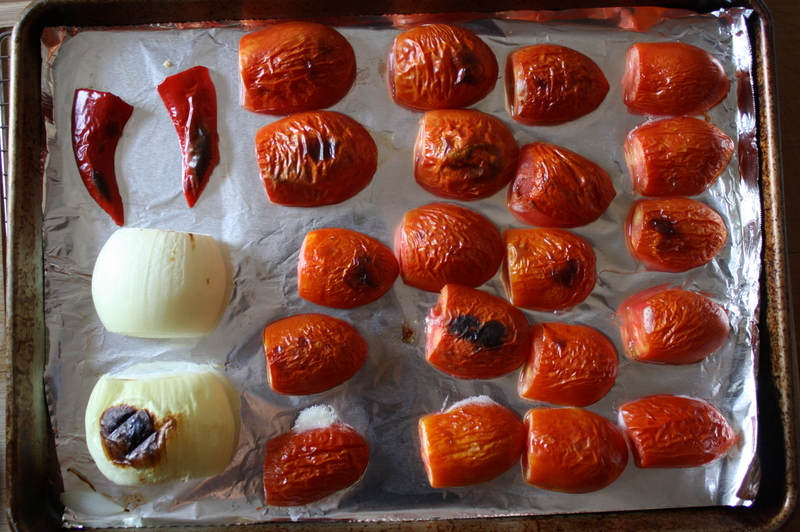 Broil until starting to char, about 5 minutes. Pulse tomatoes and jalapeno in food processor until chunky. Chop onion and mince garlic. Heat a large dutch oven over medium-high heat. Add oil. Working in batches, brown chicken in a single layer, allowing to sear before stirring, 5-6 minutes. Transfer to a plate. Reduce heat to medium. Add onion to skillet. Cook until soft and golden, about 8 minutes. Add garlic and cook until fragrant, about 30 seconds. Add chili powder and 1 1/2 tsp salt. Cook, stirring for one minute. Stir in chipotles, and drain fat off chicken and add chicken to the pot. Raise heat to high. Add tomato-jalapeno mixture. 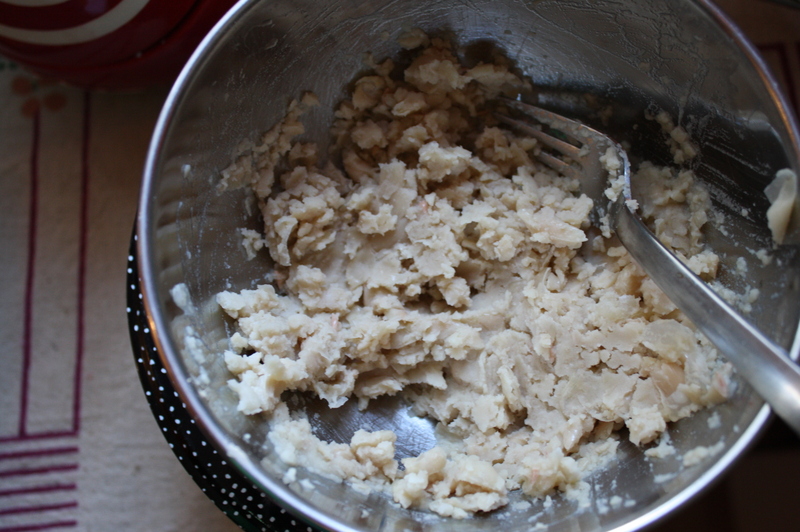 Cook, scraping up browned bits, until fully incorporated, 3-5 minutes. Stir in stock; simmer for 20 minutes. Add beans, simmer for 10 minutes. We served topped with sour cream and tortilla chips on the side…it would also be great with shredded cheese and chopped avocados, and with corn bread on the side. Happy birthday, Desi! My son is 3 today, and it reminded me of this soup, which I made for his birthday party last year. This year we’re skipping a meal with the party, but I made the soup this week anyway because it was on my mind, and it is SO GOOD!!! This has got to be at least in my top 5 favorite soups, if not number 1. I saw Ina make it on Barefoot Contessa last fall, and have made it SEVERAL times since. It was in the same “bread” episode that I got this recipe, which is also pretty wonderful. 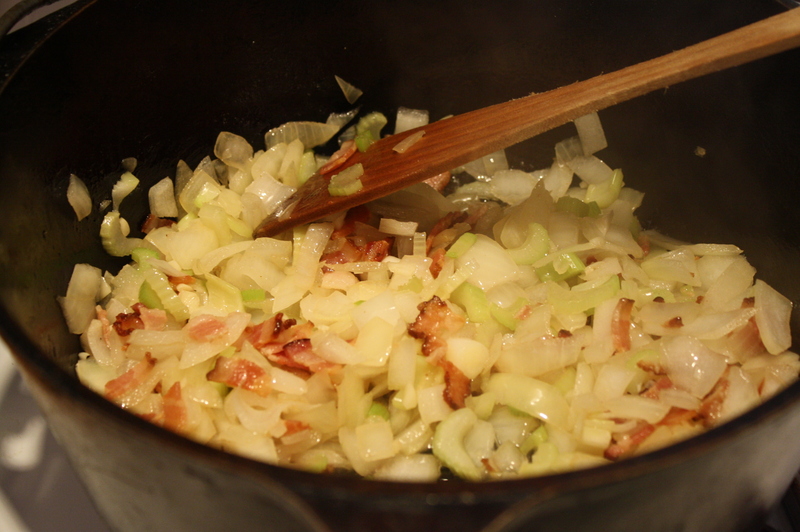 Anyway, back to the soup…for one thing, it has fennel in it, which is fast becoming one of my favorite ingredients. If you haven’t tried fennel yet, you must…it adds so much flavor to things! The other awesome thing about this soup is the topping–you have to make that part, because it’s divine. If you’re making the soup vegetarian, it’s no problem, the topping will be just as good without the pancetta (although you may need to add a smidge of olive oil to make up for the lack of grease). If you’ve never used fennel before, you chop it like you would an onion. First, you need to remove the stalks completely, then cut the bottom off, and then slice it lengthwise. Remove the outer layer, and cut out the core at the bottom. 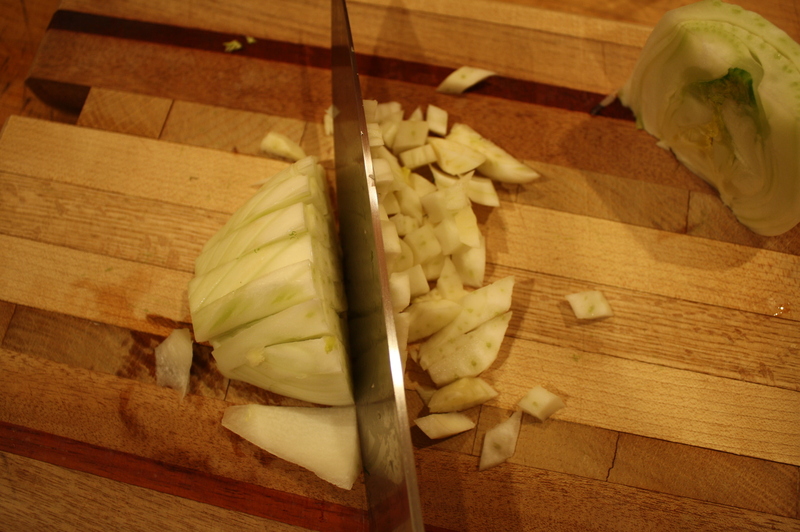 Then lay one half cut-side down on a chopping board, and slice lengthwise into 1/4″ slices. 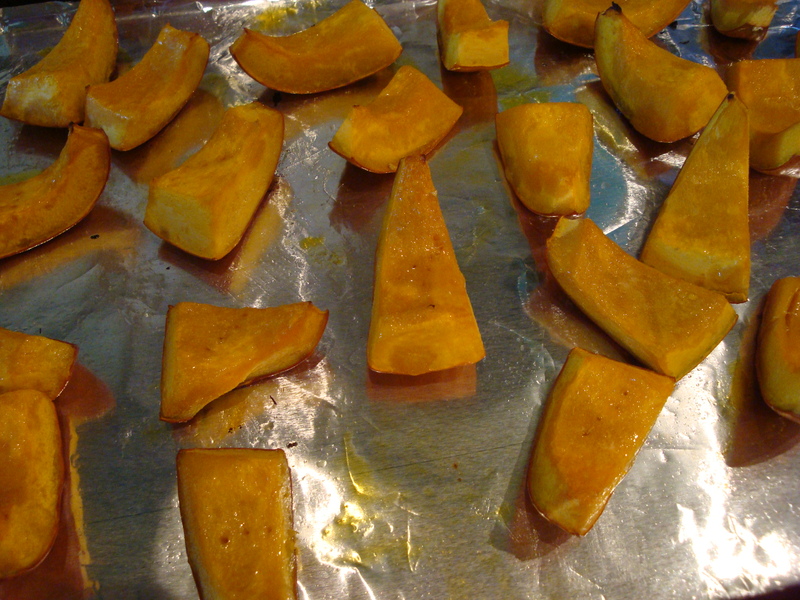 Then slice again crosswise, in about 1/4″ slices. Super easy. If you have leftover croutons after the soup’s all been eaten up, they also taste great on salads (including the pancetta)! Make this vegetarian by replacing the chicken broth with water, and eliminating the pancetta. Make it vegan by eliminating the parmesan, which I actually did last time I made it and it was just as delicious! I found that one large loaf of ciabatta will work for both the soup and the topping. I don’t remove all the crusts from the bread that I put in the soup, just the toughest bottom part (I have a hard time wasting all that bread!). 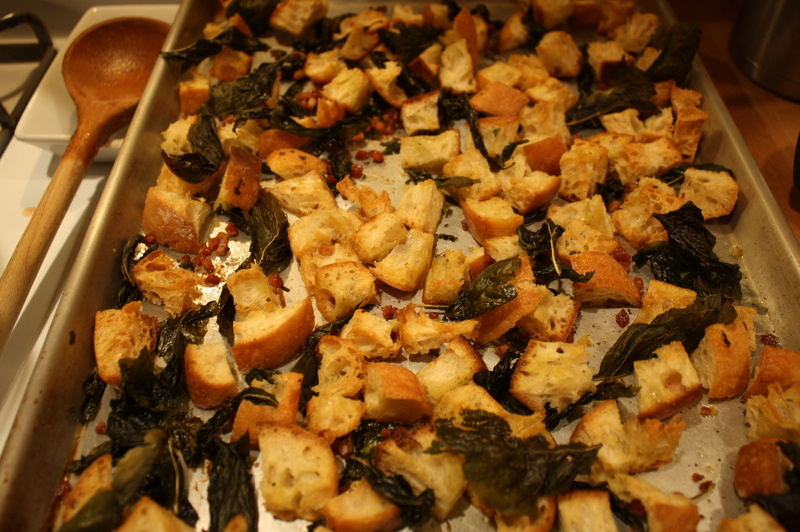 For the topping, place the ciabatta cubes, pancetta, and basil on a sheet pan large enough to hold them in a single layer. Drizzle with olive oil, sprinkle with salt and pepper, and toss well. Cook, stirring occasionally, for 20 to 25 minutes, until all the ingredients are crisp. The basil leaves will turn dark and crisp, which is perfectly fine. Reheat the soup, if necessary, beat with a wire whisk until the bread is broken up. Stir in the Parmesan and taste for seasoning. Serve hot sprinkled with the topping and drizzled with additional olive oil. I think I’ve had enough meat and potatoes to last me a lifetime. I can’t believe those words are coming out of my mouth…I’m a total meat-and-potatoes kind of girl. But we had the most rich food over the holidays (like, for example, potatoes whipped with a stick of butter, 8 oz. cream cheese, and a cup of sour cream! ), and then had them as leftovers, and I think I’ve really had enough. I found this recipe last year on Food 52, and have made it a couple of times. It’s quick and easy, and very heartwarming. And you can easily make it vegetarian by omitting the bacon, instead using 2 tbsp olive oil to saute the veggies, and vegetable broth or water in place of the chicken broth. We’re definitely going to be eating things like this for the next several weeks!! 1. In a Dutch oven, cook bacon over moderate heat, stirring until crisp. Add onion and garlic and cook, stirring occasionally, until onion is soft and transparent. Add celery and cook another couple minutes. Add broth, salt and oregano and bring to a boil. Turn heat down to low, and simmer, covered, for 5 minutes. 2. 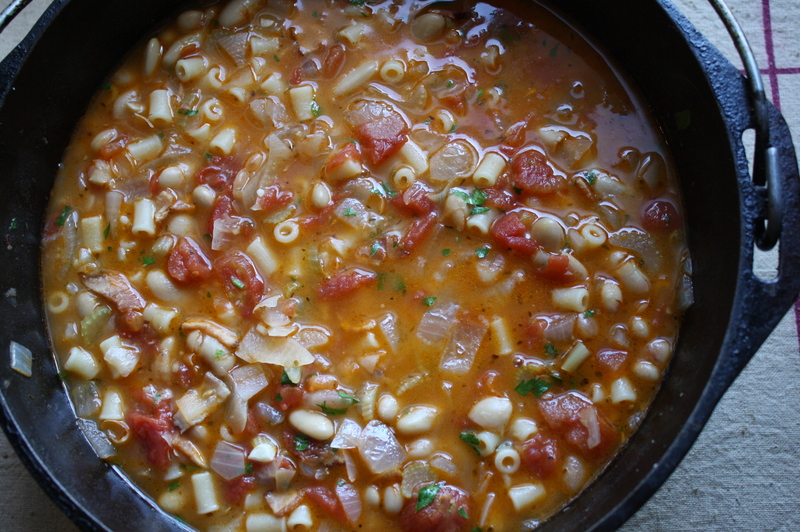 In a bowl mash 1 cup of the beans, then stir them into the onion mixture along with the remaining whole beans, tomatoes, and pasta. Simmer the soup, covered, for 15 minutes, or until pasta is al dente. Then remove from heat and let stand, still covered, for 5 minutes. 3. Stir in parsley and grated parmesan (I used about 1/4 cup). Serve with crusty bread. This recipe from Stephanie Meyer of Fresh Tart showed up in my Facebook feed at just the right time. I had just made 5 quarts of turkey stock and had leftover turkey and many other ingredients on hand. 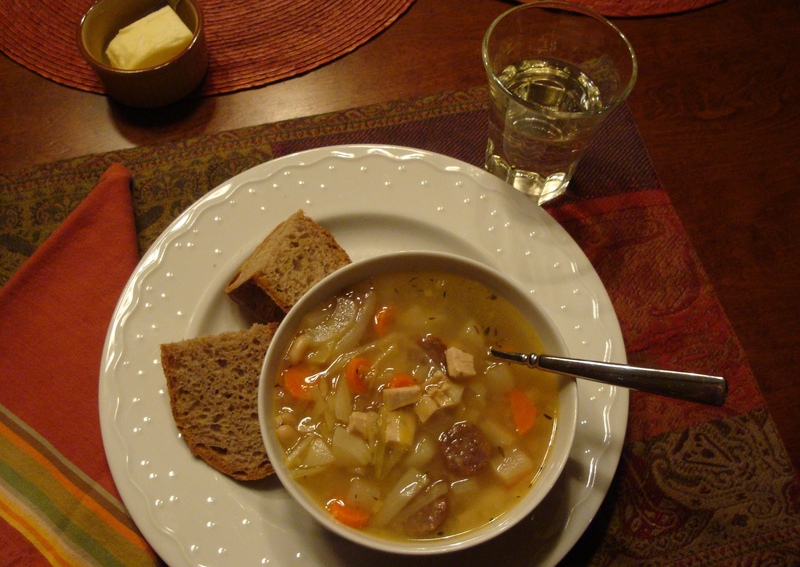 Plus, it was 9 degrees out – perfect for a hearty soup. I added the term “old world” because it has many ingredients that fall into that category to me – cabbage, turnip, potatoes, polish sausage, etc. This is my riff on her original recipe, which used chicken/chicken stock. This soup is slightly sweet, so I recommend serving it with a sour, hearty bread and sweet cream butter. I’ll mention for you Minneapolitans that pictured is the Miche loaf from Rustica – a perfect complement! Coat the bottom of a dutch oven with the oil and bring to medium-high heat. Add the onion and leek, turn the heat down to medium and saute for about 5 minutes until soft. Add the garlic and saute 2 minutes more until fragrant. Add the stock, bring to a boil, turn down heat and simmer for 1 hour, covered. Add the carrots, turnip, potatoes, sausage, cabbage and thyme and simmer for 30 minutes uncovered, till vegetables are done and liquid is reduced. I recommend that you check after 20 minutes to make sure that you don’t overcook the vegetables. Add the beans, turkey, salt and pepper and heat to serving temperature. This can be made ahead and reheated, but it won’t freeze well because of the potatoes. *The recipe called for polish sausage. I had chicken andouille sausage on hand so used it. I think any smoked sausage would work well with this soup. It’s soup weather and this recipe is perfect for this time of year. It uses pumpkin and sweet corn, and there is a very narrow slice of time when fresh sweet corn and winter squash are both available locally. 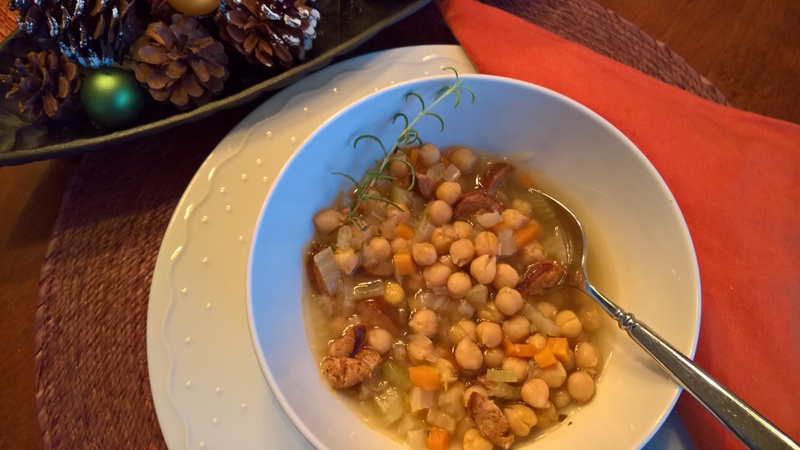 This soup is tied for first on my list of favorites with Rosemary and White Bean Soup. 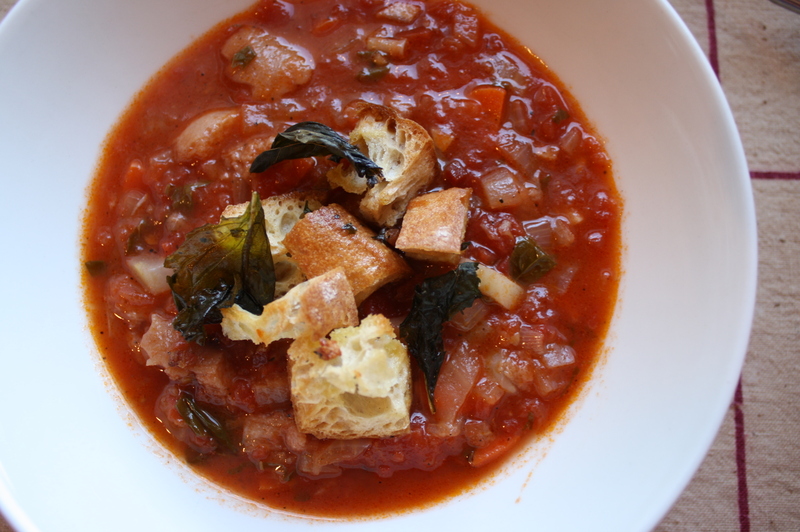 I can’t wait for this time of year to make this recipe, and it’s just cool enough out today for soup. 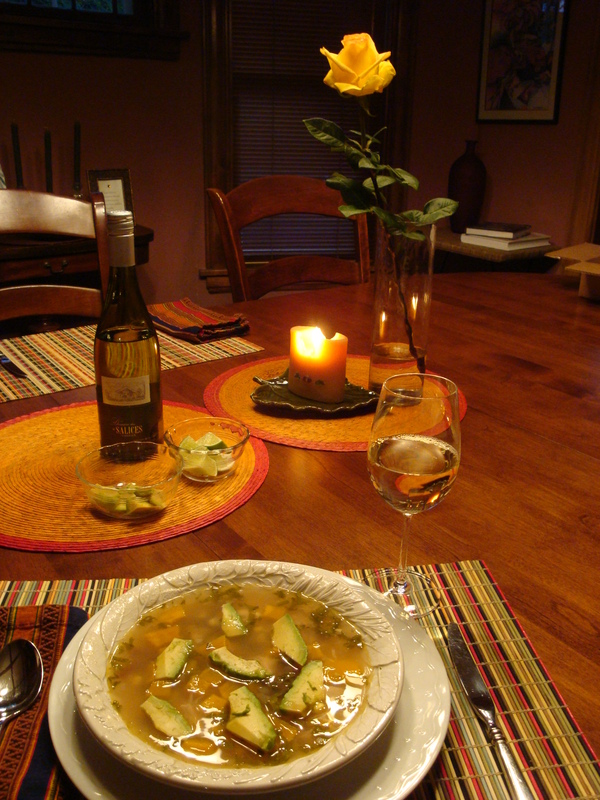 A Viognier was recommended as a wine pairing for this soup – a French version goes perfectly! 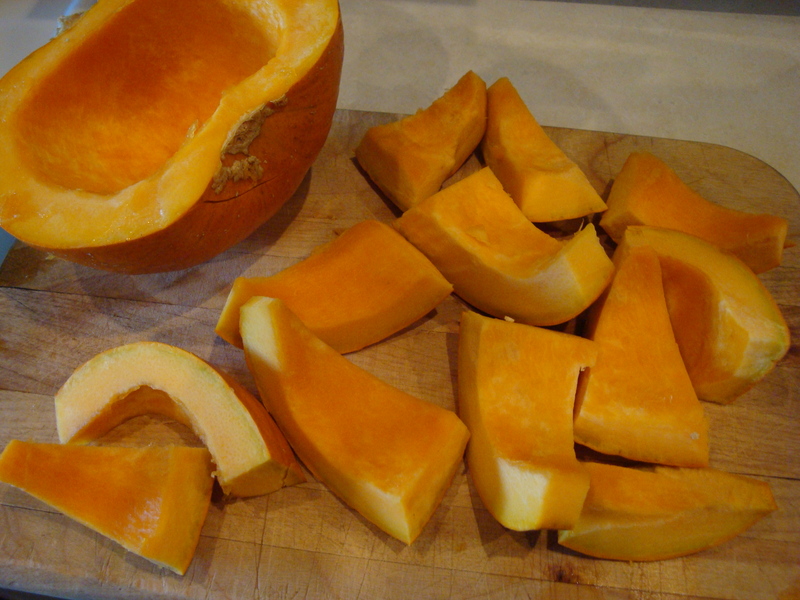 Cut the pumpkin or squash in half, seed and cut into 1 1/4-inch slices. I like the pumpkin flavor better, but squash is good if you can’t find the little sugar pumpkins. Brush the slices lightly with vegetable oil. Place on a baking sheet and bake at 400 degrees for about 20 minutes, until just tender. Don’t overcook or it will get mushy when added to the soup. Let cool and then remove and discard the skin. Cut into 1/2-inch dice and set aside. 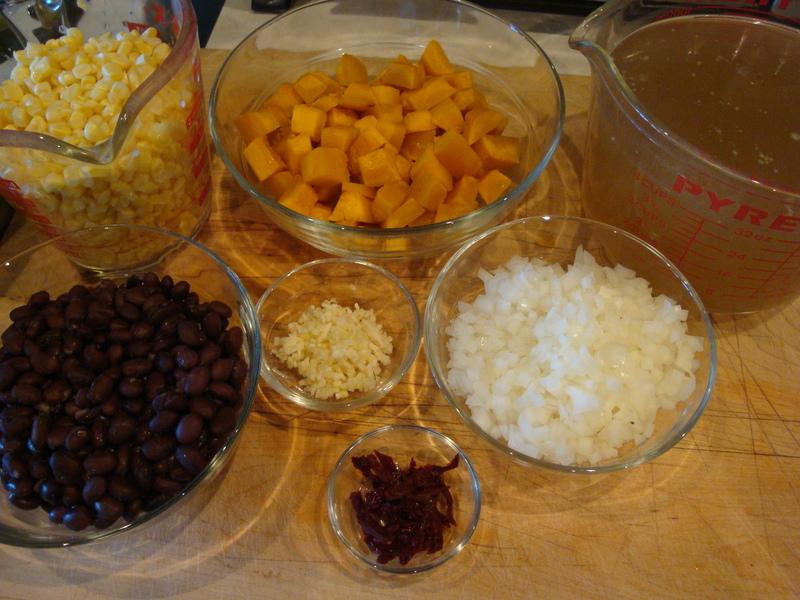 (This is a pic of my mise en place for this phase of the soup. I love knowing this term, which I learned recently from this interesting N Y Times magazine article on cooking prep.) In a large dutch oven or soup pot, saute the onion in the oil for about 5 minutes until soft. Turn up the heat a little and cook until the onion starts to brown. Add the garlic and cook until fragrant, about 1-2 minutes. Add the chicken stock and bring to a slow simmer. Rinse, seed and thinly slice the chipotle peppers then add to the broth. I recommend starting with one and seeing how much heat it adds to the soup, adding the second one if you’d like to amp it up a little. 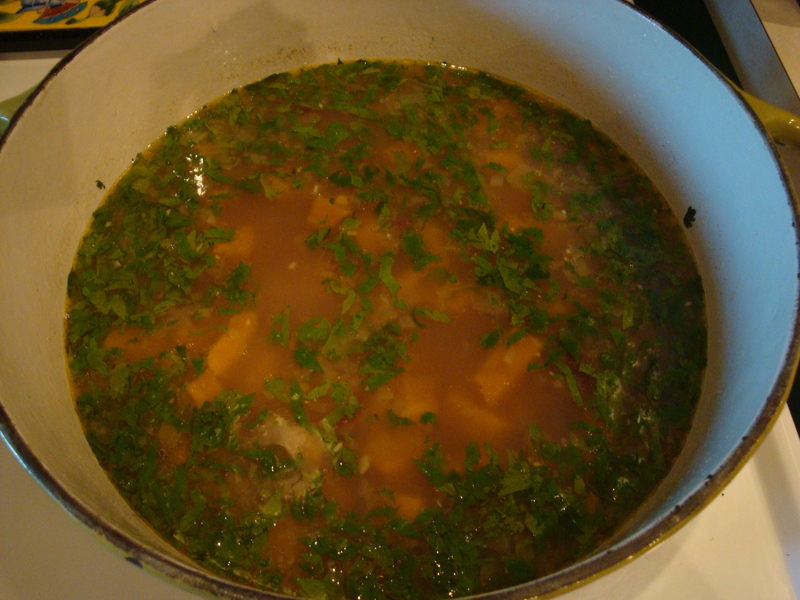 Simmer the broth with the pepper for a couple of minutes and then add the pumpkin, corn and beans. Simmer over moderate heat for 15 minutes. COOK’S NOTES: This can be done a day ahead of time. If so, reheat before going on to completing the soup. For a vegetarian version of this soup, use mock chicken broth powder to make the broth. Substitute brown rice or tofu or both or none for the chicken in the next step. Stir the chicken into the broth and cook until just heated through – do not boil. 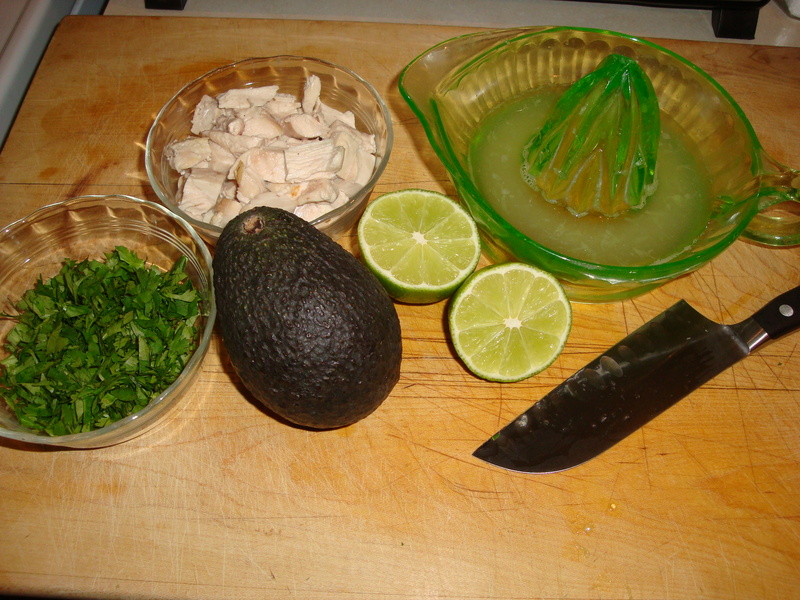 Add the lime juice, the cilantro and season with salt. COOK’S NOTE: I use more cilantro and less chicken, sometimes omitting the chicken altogether. You can use chicken from making the stock, leftover rotisserie chicken, or (as I did this time), bake a couple of chicken breasts or thighs. Ready to serve! Ladle the soup into large soup bowls. Pass the lime wedges and avocado.